Adeptia Integration Suite provides rich workflow capability that allows companies to take their manual business processes and convert them into functional workflows that can be tracked, monitored and automated based on specific business rules. Adeptia leverages its expertise in Business Process Management (BPM) technology to help companies take a process-centric approach to IT to solve critical business problems quickly and easily. In this article we would use three business use cases to highlight how Adeptia supports the design and automation of busiess workflows. Adeptia supports full integration capability to sync-up data between workflows and applications. Now let's get started with our first example. Order to Cash process consists of various steps from the point of receiving the purchase orders to the point of invoicing the customer. Gateway conditions (or decision nodes) provide the ability for the user to embed process rules that govern the behavior of the workflow at run-time. For example, if a PO amount is greater than $5000 then send the PO to Sales for manual verification before processing the order. Another key aspect of the workflow is that it requires data transformation and integration with other systems. For example, doing a lookup into the master database for customer account verification or normalizing codes from one type to another. There can be integration hooks to ERP such as SAP, JD Edwards, Oracle EBS, and backend databases for archival or inventory updates. Integrating with Dashboards or custom reports to allow business users to see the Sales trend over a period of time is another useful data visualization aspect of a workflow. Using Adeptia’s Process Modeler interface we can first design out the entire process graphically by clicking and dragging the objects from the BPMN (Business Process Management Notation) pallet and configuring each activity’s function as it relates to the Order to Cash workflow. Process flow designs can vary based on the type of business rules you want to apply on them and the function they are performing within your company. There can be process rules governing the validation of a purchase order from a customer and how to handle it in case of errors related to incomplete PO. 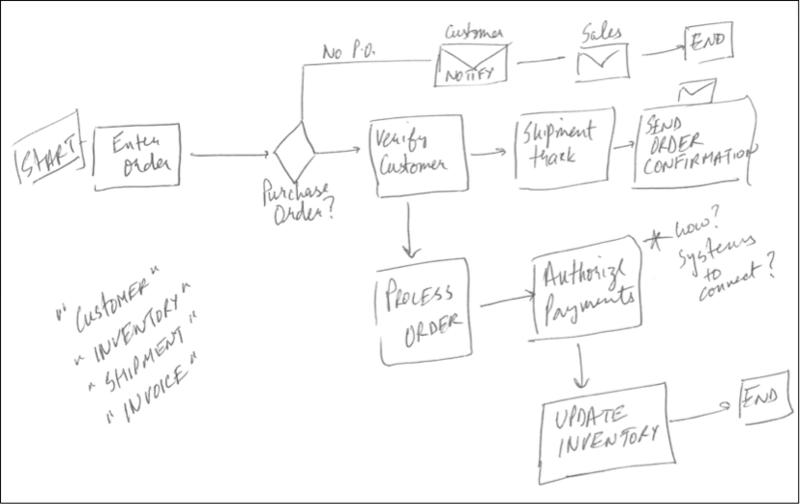 For example here’s another illustration of “Order to Cash” process flow that handles exceptions in case when a customer does not enter a Purchase Order correctly. Below diagram depicts an approach on how exceptions can be handled through a process flow and this can be translated into a functional workflow in Adeptia Suite. A parent process can have several sub-processes or child-process as in the case of the above example; the step in orange is a sub-process that has additional business operations to handle exceptions. A second example we would like to show is the Purchase Requisition workflow. Process rules around this workflow can consist of checking the validity of the Purchase Requisition in terms of Employee ID, valid Department, valid Amount and item type allowed by the employee's department. There can be additional routing rules on who gets notified if a requisition is above certain amount that falls outside the boundary of pre-approved price rule. There can be hold-offs where a process flow is paused as it waits for pending information from the employee related to that requisition. Decision nodes play an important role in routing the requisition back to the previous task participant in case of invalid information. For example, if the request to purchase a laptop doesn't comply with the departmental policies on price then there should be a way to route back the requisition to the employee or supervisor for correction or resubmittal. When designing a workflow you can add multiple decision nodes (or gateway rules) at different stages of the process that in-turn govern its behavior at run-time. A typical employee onboarding process has multiple steps starting from the event that kicks off the process such as changing the status of a candidate to “hire”, provisioning the new employee by setting up their network ID, creating a company facility access badge, opening up email and application access, provisioning a company credit card for expenses, and notifying IT Help Desk to configure a laptop and phone. Rules around employee provisioning may vary depending upon whether the candidate is a full time or a part-time employee or a contractor. 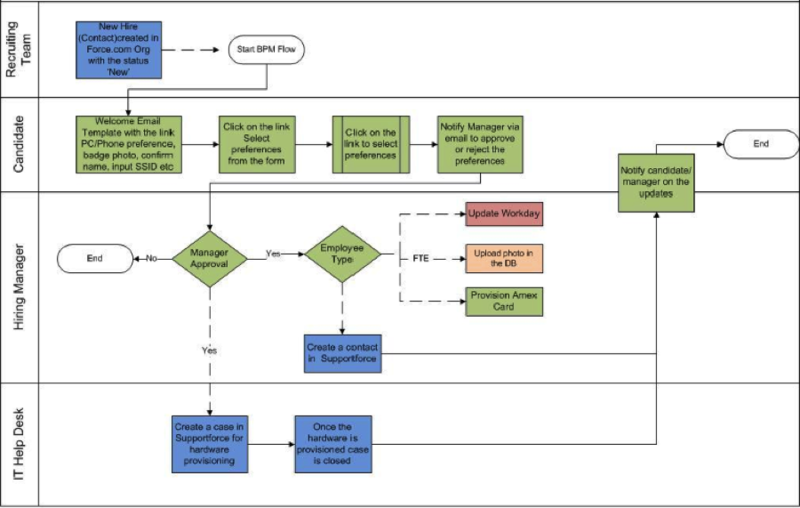 Here’s an example of a workflow process in Visio. You can import a Visio diagram into Adeptia Process Modeler and get started quickly without having to draw the flow from scratch, it saves time and allows you to focus on configuring the process flow rather than redrawing it in Adeptia. Workflows related to new employee provisioning can also require integration with Cloud based SaaS applications such as Workday, BambooHR, online Payroll services, connecting to internal systems such as IT Help Desks, updating ticketing system and notifying managers and supervisors about the status of the employee onboarding. Adeptia provides out-of-the-box integration adapters to on-premise and cloud applications in order to fully convert your manual business processes into automated workflows. How is the workflow task shown to an end-user? Run-time interaction with workflows should be easy and intuitive and should not require technical knowledge on how to access and work on a task. Just like we see emails in our inbox, similarly we show workflow tasks on the Adeptia’s Workflow Task Manager. Here’s an example of a Task Manager that shows the Task Name, Description, Priority, Due Date. User clicks on the task link which opens up a web form to allow user input. Here’s an example of a task form that allows user to enter their input and submit their work. Adeptia provides a rich Web Form design and publishing interface that allows users to interact with workflow task forms through any device. How does one keep track of the workflow tasks? Keeping track of workflows and monitoring user performance is important part of workflow automation. Adeptia Suite provides pre-built dashboards to show what are open tasks, which ones are on track, which ones are about to be due or the ones that are past due. 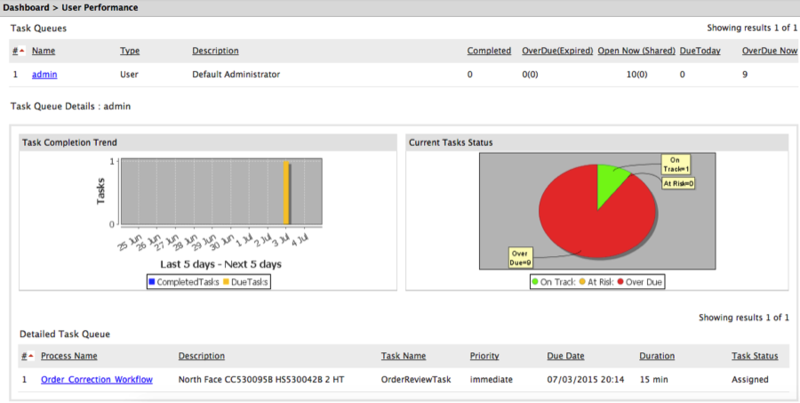 There are additional data points shown in the dashboard such as the amount of time that a task is open or waiting for user to respond. Managers can drill down into each workflow to see its current status. 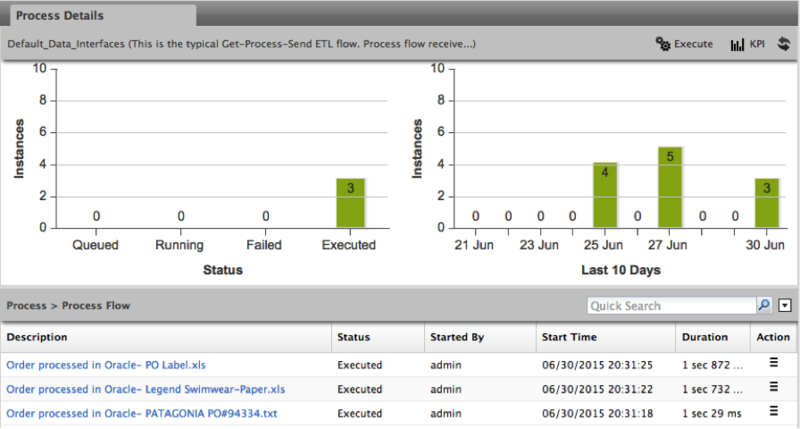 Dashboards also show the active workflows and the ones that have been completed. Detailed Task Queue lets the users see for how long a task is pending and you can reassign the task to another user. Users with access rights can view the details of each of the workflow and see the time it took to complete a workflow, where the bottlenecks exist or identify the parts of the process flow that can be optimized for better performance. 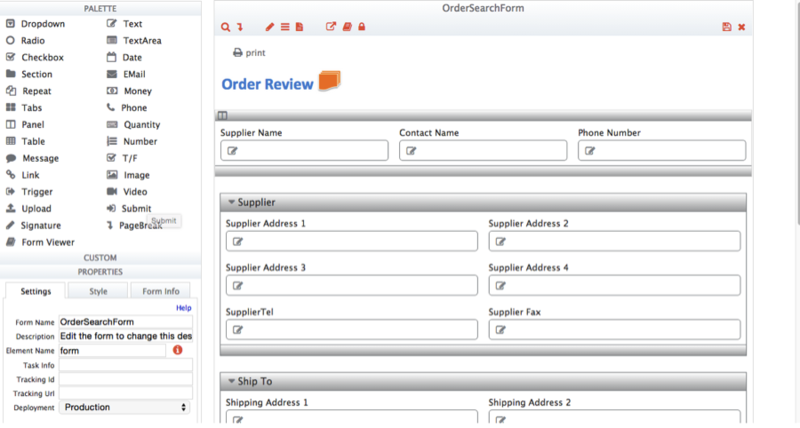 Search capability allows users to search a workflow based on the business data fields such as PO#, Item ID or Customer Name etc. 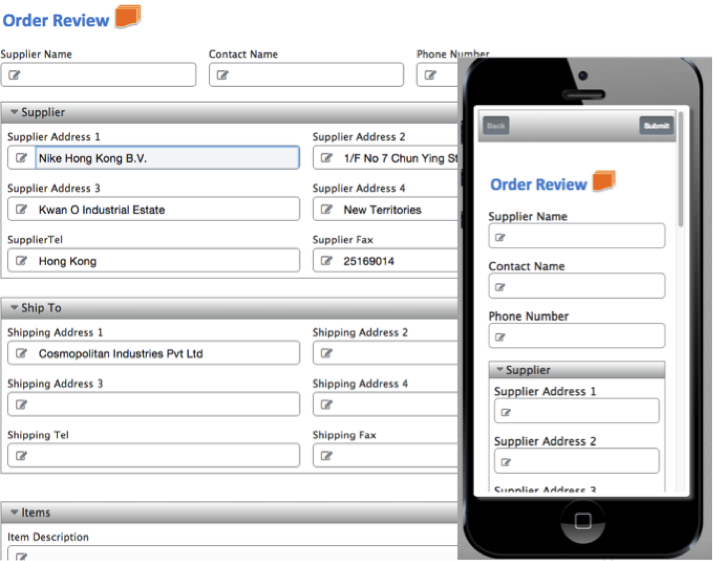 How does a user configure web forms in designing workflow tasks? Adeptia provides a rich out-of-the-box web form designer interface. With click and drag capability, users can build dynamic web forms to render data that is visually rich and provide an easy interface for user to interact with the task content. How does user configure workflow task assignment rules? To configure rules around task assignment, you can select a “role” or specific user(s) from the list, setup escalation and notification rules as shown below. Alerts in the form of email notifications can be sent out to Managers or Colleagues in case when the process participant is not available to respond to a particular task. User can also attach documents to the tasks. Adeptia Integration Suite is the only product that combines workflow and data integration in a single platform.